Paramount Home Media has announced the release dates for 10 Cloverfield Lane on Blu-ray Disc, DVD, On Demand, and Digital HD. The film will first be available in Digital HD format on May 31, followed by Blu-ray Disc, DVD, and rental options on June 14, 2016. 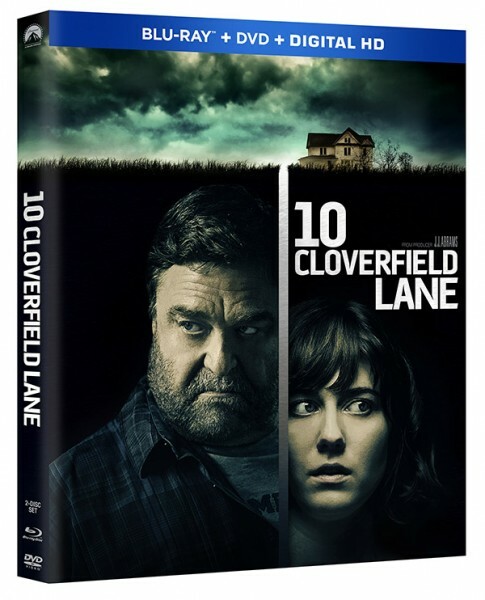 On Blu-ray Disc (available in a Blu-ray Combo Pack with DVD and UV digital copy), 10 Cloverfield Lane is formatted in 1080p (Full HD) with English audio available in both Dolby Atmos or Dolby TrueHD 7.1 depending on your sound system. Dubbed audio is also available in French, Spanish, and Portuguese in 5.1 Dolby Digital. The single-disc DVD is formatted in widescreen 16:9 with English 5.1 Dolby Digital. Extra bonus content on the Blu-ray edition includes commentary from director Dan Trachtenberg and producer J.J. Abrams, as well as over 30 minutes of behind-the-scenes footage. The film will also be available in exclusive Best Buy and Target Blu-ray editions. No word yet on a 4k Ultra HD Blu-ray edition of 10 Cloverfield Lane.